For many new parents, the imminent arrival of a baby means incredible amounts of spending - and sometimes, incredible amounts of money too. But while many baby products are a waste of money - our Gumtree selling history is a parade of brilliant baby things we never used - some are really important: good luck getting out of hospital without a midwife-approved car seat, for example. From prams to bottle warmers, room thermometers to baby monitors, these are our picks of the products parents are likely to want and need. We’ve taken a middle-ground approach to price: in each category there are considerably cheaper and more expensive options, but the one we’ve chosen is the one we’d buy with our own money, budget permitting. So for example if money’s no object you might happily drop £1,000-plus on a travel system - but we think for many parents Mothercare’s sub-£300 option makes more sense. It’s possible to get many baby items second hand to save money, of course, but there are several items you should buy new. Don’t buy used car seats, because you can’t always see if they’ve been damaged; and don’t buy used mattresses, because you’ve no idea what could be lurking inside them. If you do manage to snap up any pre-loved bargains and have some cash left over, mums can treat themselves to that new mascara they've been eyeing up, or a luxury face mask for some much-needed downtime. Winner of the prestigious Made for Mums Gold Award in 2017, the Cloud Q ticks almost all of the boxes for a car seat the midwives will let you take baby home in: the only real negative is that it isn’t compatible with i-Size, the incoming car seat regulations that apply to new seats from 2018 onwards. It’s a Group 0+ seat, so it’s suitable from birth to around 18 months or 13kg, and it has side impact protection, a sun canopy that isn’t too fiddly and a useful lie-flat feature for keeping baby undisturbed once you’re home. Like all such seats it’s heavier than it looks, but it’s well built, very safe and easy to install with a seatbelt or the optional Isofix fittings. If this one doesn't have you sold, check out our top tips for buying the ideal car seat for your child. The SnuzPod is a lovely looking thing, but it’s not a case of style over substance. It’s as practical as it is pretty, with curved lower rails for gentle rocking and a mesh wall to keep baby from rolling out. It’s designed to be three products in one: a Moses basket, a bedside co-sleeping cot or as a standalone crib, and it does all three things very well. The SnuzPod is height adjustable between 37 and 58cm and includes a mattress; it’s a non-standard size but it’s the same as the Chicco Next2me, so getting bedding shouldn’t be too difficult or expensive. At 18kg it’s hardly portable, but it’s easy enough to slide around. If you are looking for the best co-sleeper cot for travel, check out our article on the best co-sleeper cots 2018. If you fancy designer style but don’t have a designer budget, this recently reduced Mamas & Papas cot package is very good value for money. The cot itself has three height positions for easy access, an over-cot baby change station, under-cot storage and a mattress too. The design is clean if a little bland, but it won’t dominate the room the way some more overstated cots can do - and it takes up considerably less space than cute but enormous sleigh beds, which seem like a great idea until you have to move them around. If you’re looking for something a bit nicer than a budget cot but don’t want to spend really enormous amounts of money this is an excellent package. The Koo-di Lottie is a very popular choice on Amazon and with good reason: it’s a Mother & Baby Award winner thanks to its smart design and sensible fabric choice. Polyester might not be the most sumptuous material but it’s water repellent and easy to clean, and believe us that matters. Particularly well suited to the British weather it has three internal pockets, an insulated bottle holder, a strap for keys and six external pockets, so you can segregate dirty stuff and have essentials such as wipes and dummies to hand without having to rummage for ages. Our only niggle is that the shoulder strap is quite short, so it’s only usable as a shoulder bag if you’re quite small. If this bag isn't your style, we have a whole range of changing bags picked out for all the yummy mummies and daddies out there to choose from. Chances are when you go to the baby aisle, you’ll see the Tommee Tippee logo: it’s the big daddy or mummy of baby kit in the UK, and its closer to nature bottles are pricey but effective. They’re also big, and this bottle warmer has been designed to accommodate them as well as food jars and pouches. It takes about four minutes to warm 150ml of milk from room temperature; if it’s been refrigerated it will of course take longer. Just watch out for the lack of an automatic shut-off: it doesn’t turn off when you lift the bottle, jar or pouch out. You could achieve the same results with a bowl and kettle, but it means you’re not messing around with boiling water when you’re too tired to see. We previously recommended a different Xpedior model, but that deal has been discontinued. Never mind, because here’s another good Xpedior deal: for £275, £75 less than RRP, you get this three-wheeled pram and travel system. That means it can be used as a lay-flat pram, as a buggy, or with the seat unit left at home and the car seat attached to the frame instead. The pneumatic tyres - a pump is included - make short work of rougher terrain and the double front wheel makes it more stable than other three-wheelers. When you compare the cost of this system to other brand-name travel systems you’ll see that it’s a lot of pram for not a lot of money. Let’s get the obvious advice out of the way first: baby will outgrow it quite quickly, and you’ll probably end up using a cheap mat on the floor after a few weeks anyway. That said, if you want to keep baby stuff organised it does make life considerably less messy - provided you have the room for yet another bit of furniture. If a cot-top changing station isn’t ideal, we’d recommend something that can live on as a nice bit of furniture after its changing days are over, and Mamas and Papas’ Atlas Dresser is just that: cute enough for a baby’s room but not so cute it’d look odd in an older child’s room. Luvion might not be a household name, but it wowed the judges of the Mother and Baby Awards: in 2017 this baby monitor won the prestigious Gold award in its category. It supports up to four cameras with split and quarter screen viewing, has LED lights to alert you when you’ve got the sound switched off, has a nightlight option and preset lullabies to help soothe your child and offers both infrared night vision and room temperature monitoring. The main draw here, though, is the relatively huge screen: it’s seven inches diagonally, with touch-sensitive buttons below the display and a joystick to control the camera. It’s very easy to use and the supplied camera includes a ceiling mount and fixings. 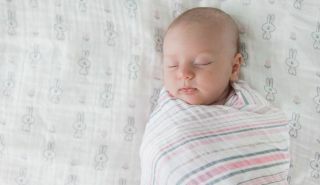 We’re huge fans of the original Gro Egg: instead of trying to remember whether 19.2 degrees is good or bad for baby, it enabled us to see instantly whether our babies’ rooms were too hot, too cold or just right. It does that with a simple colour code: it glows blue if it’s too cold, red if it’s too warm, and yellowy-orange when the temperature’s fine. The new model is currently exclusive to John Lewis and is 33% bigger, with four adjustable brightness levels. That’s handy, because the original could be awfully bright - but then again, your baby may prefer a brighter nightlight, and the Egg 2 can do that too. It’s a brilliant idea made a little bit more brilliant in its second generation. With three separate sections the Tippitoes Top and Tail bowl is ideal for cleaning newborns’ faces and bottoms - the latter after the former, of course - as there’s room to keep your clean water, clean cotton wool buds and used wool buds separate. When baby’s old enough for normal bathing the bowl is still useful as an organiser for your various changing essentials. The promo photos on Amazon make it look like it’s dark grey on the outside and white inside; that’s a shadow, not a design element. The whole thing is ivory coloured. It’s also worth noting that Tippitoes’ bowl is one of the larger ones you can buy: it’s 40 x 24 x 11cm.